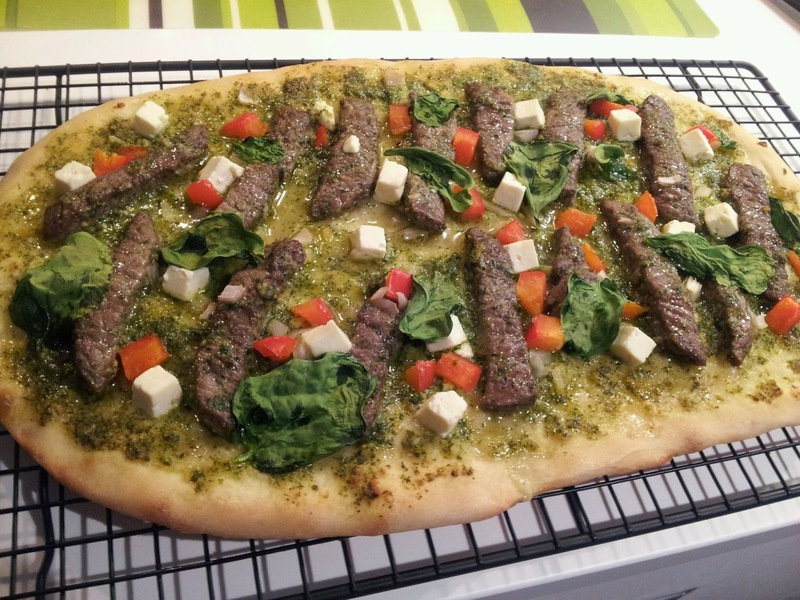 To put my Spinach Basil Pesto to use, I made this Steak and Pesto Flatbread. Since I prefer thin crust, I used half of a frozen pizza dough for this, but you can also make your own whole wheat crust. You can use chicken as an alternative for this, but I thought steak was a nice change. Each serving contains 17.3g of heart healthy monounsaturated fats (the remaining fat is saturated from the cheese). Slice beef into 1 inch wide strips. Place a skillet over medium-high heat and add 1 tbsp pesto and beef. Stir to coat the beef with pesto and sear the beef so it is cooked rare (about 1 minute, it will cook further in the oven). Remove from heat and set aside. Grease a large pizza pan and roll out pizza dough as thin as possible. Add remaining 3 tbsp of pesto on top of dough and spread evenly. Place slices of beef evenly across the flatbread and add onions, peppers, spinach and feta. Season with black pepper. Bake for 15 to 16 minutes, until crust is lightly browned.